H & M – WHAT IS JAMES WEARING? James Andrew - Anse du Gouverneur. 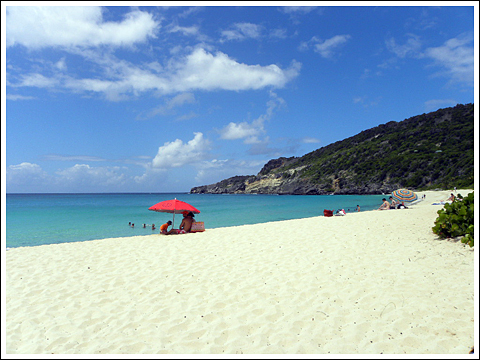 Another favorite beach to visit while in Saint-Barth is the secluded Gouverneur – smaller than Saline but just as spectacular. From here one might head over to Anse des Flamands. On your way there I wholeheartedly suggest a stop at La Langouste for their lobster salad – wash that down with rosé – and the coup de grâce? – the pineapple carpaccio flambeed with old rum of course! 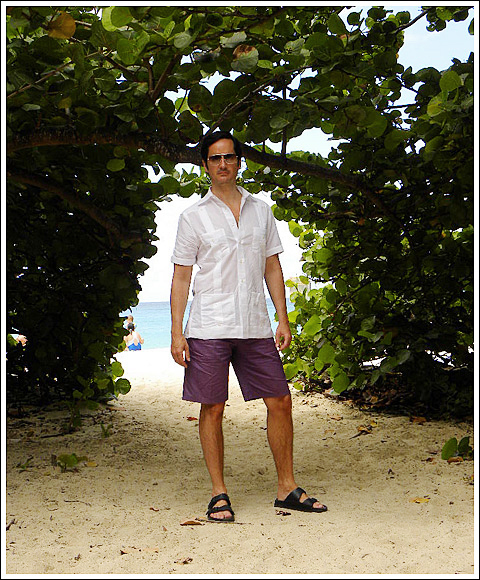 Pausing (top) for a shot at the dreamy seagrape gates to Gouverneur, I’m wearing a Michael Bastian Cuban-style guayabera shirt in white linen, H & M purple poplin shorts and black rubber Birkenstock sandals, Dior sunglasses, (not shown, a black Amalfi bikini). I typically wear long pants and a jacket while working, because I prefer a more dressed up vibe. However, when it is over ninety degrees and I’m not meeting with clients, I’ll make an exception! On a day filled with wallpaper installations, shopping for clients, and running errands around the city I put together a super casual ensemble that I felt was still chic and well put together. 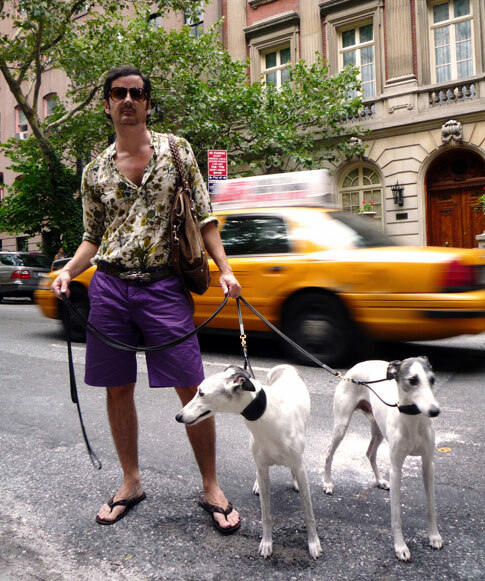 Gucci shirt with band collar and epaulets in multi-colored green floral on white cotton voile, purple cotton poplin shorts from H & M, chartreuse Gucci python belt with silver double horsehead buckle, woven fabric and leather flip flop sandal and brown suede and leather satchel both by Gucci, sunglasses are Tom Ford and enjoying a walk with me on one of the wonderfully tree lined blocks of Murray Hill are my lovely constant companions, Rupert and Nigel. Taking a pre-dinner stroll to find inspiration in the fabulous Bermudian architecture, I found myself on the grounds of the “Tankfield” estate. A wonderfully elegant home, it was considered the most fabulous house in Bermuda when it was built in the early 1700’s. Its stair case embraces visitors as they ascend to the grand entrance, (in fact this sort of staircase is known as a “welcoming arms.” The beautifully balanced facade is inspired by classical Georgian architecture. 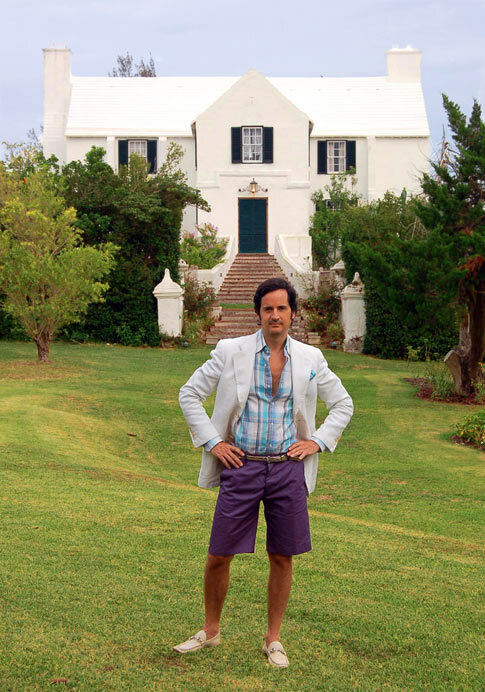 The shutters and doors are painted a green black – quite reminiscent of Farrow and Balls‘ “Studio Green” and is a typical color used in Bermuda. Traditional roofs are rather sophisticated – a stepped design collects and funnels rain water to holding tanks, and the roofs are lime-washed to purify the water and then painted white to reflect the scorching sun. I always feel so enriched by my global adventures and house tours, and take a away a wealth of knowledge and inspiration to put to good use in future projects. Dressed in typical Bermudian gentleman’s dinner attire, I’m doing a shorts and jacket look- (minus the black knee socks!). Jacket is Gucci white linen, purple shorts are H & M, Gucci white turquoise and purple plaid linen shirt, turquoise silk pocket square by Charvet Paris, silver chain link belt and white leather loafers also by Gucci.